Do you love action sequences? If so, then this is the book for you! The mysterious Pulse swept across the universe, infecting worlds with various levels of technology-killing radiation, putting some planets pre-spaceflight or even pre-electricity. But alongside the Pulse, something else happened… children started to be born with unusual powers, and an organization called the Justified believes these children are the answer to defeating the Pulse. A solider for the Justified is sent to a low technology world to rescue a girl they’ve identified as having powers… but she isn’t the only one looking for the girl. And even once she finds her, they still have to get back to the Justified’s sanctuary, while an even larger threat is yet to be discovered. The first-person protagonist of The Stars Now Unclaimed goes unnamed throughout most of the novel. She’s trained to avoid telling her charges her name so that they will get attached to the Justified as an organization, not her. She’s reluctant to reveal much about her background, but some things are clear. She’s been a soldier for a long time, since before the Pulse happened a hundred years ago, and she’s old enough to be jaded. We also know she values doing the right thing, and that she believes the Justified are the best way to accomplish this. But honestly? I wish I could have gotten more characterization. There was a lot of opportunity for character growth that went unrealized. 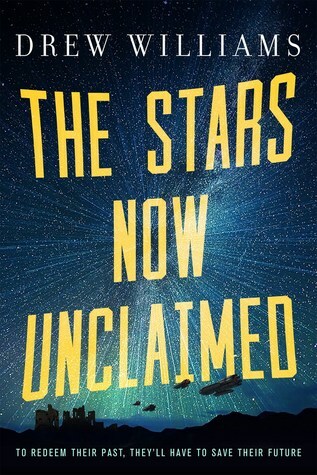 For most of the novel, The Stars Now Unclaimed has a very small cast. To start with, it’s just our anonymous protagonist, the AI on her ship, the girl she’s retrieving (Esa), and a sentient robot also from Esa’s world (the Preacher). A couple other characters are picked up along the way — a Justified information gatherer, the protagonist’s ex-boyfriend, his spaceship… but it’s not until you actually get to the sanctuary that the cast expands much. With a small central cast, you would think there would be a lot of characterization for each, but like with the protagonist, I wished for more. The majority of The Stars Now Unclaimed is action scenes. I really can’t emphasize how much of this book is action. You mainly get a few paragraphs or pages between various huge action set pieces, which doesn’t leave a whole lot of room for anything other than action. It was a bit like a Hollywood blockbuster in book form. Actually, it sort of reminds me of Star Wars… lots of action, heroic rebels versus a fascist empire, various alien species that are still somehow mostly humanoid… But even Star Wars isn’t all action, and I desperately wished for The Stars Now Unclaimed to slow down a bit to include more character development and world building. The villains of The Stars Now Unclaimed are the Pax, a fascist empire that conquers worlds and then tortures and brainwashes its victims into being the perfect Pax soldiers. It is impossible to get someone to recover from the process, so our protagonists have no moral dilemma in mowing down Pax soldiers by the hundreds. In fact, all of the antagonists of The Stars Now Unclaimed are similarly faceless, replaceable cogs, from space pirates to vicious aliens. The best thing about The Stars Now Unclaimed was the idea of the Pulse. It’s a really cool idea with a lot of great potential for world building! But it goes mostly unrealized, and world building is thin. Also, the aliens weren’t that great. Look, I really love cool, inventive alien species. The aliens in The Stars Now Unclaimed were like humans in different costumes, all of which were either vaguely Earth animals or robots. There was one part involving aliens that could have been interesting… it’s near the end, so I don’t want to say too much, but there were some presumably non-sentient aliens acting oddly. However, I think this was mostly to make the action scenes more challenging, as it was brushed aside in short order and never fully explored. I do think The Stars Now Unclaimed has an audience. It just has to be one that is mostly concerned with action sequences and doesn’t mind if they’re to the detriment of all other elements. That is not who I am as a reader, and I’m not planning to continue this series.